Review: I had the wonderful opportunity to snag an ARC (Advance Reader Copy) of City of Bones when I was at BookCon, and I’m so glad I did! This book was really enjoyable and it was an awesome summer read. City of Ghosts follows a girl named Cassandra. After she nearly drowns, she discovers herself drawn to the other side (what she calls the Veil) and that she can see the ghosts that inhabit it. She also realizes that she’s being haunted by a friendly ghost named Jacob who ends up becoming her best friend. When she travels to Scotland for the filming of her parents supernatural television show, she finds herself questioning if what she knows about the Veil is true . . . and whether or not it might be more dangerous than she realizes. Overall, I loved this book. 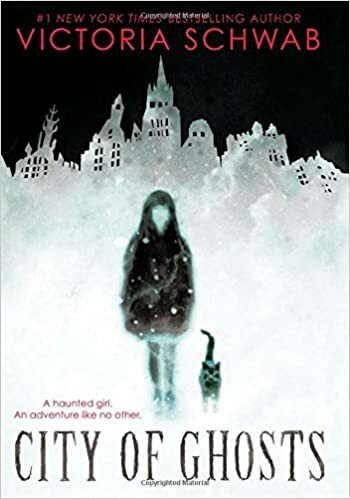 It was a quick, easy read as it is in the middle-grade genre, but it was a solid ghost story. There was some authentic humor in it that had me smiling at the pages as well as some darker moments where I was legitimately concerned for the well-being of the characters. Jacob and Cass had a great relationship and I loved the interactions and conversations between them. Schwab also did a fantastic job at describing this new world Cass was living in, providing exposition of what she could and couldn’t do with her newly acquired power in a smooth and non-intrusive way for the reader. If you’re looking for a good old-fashioned ghost story with a touch of humor and a lot of heart, I would definitely check out City of Ghosts. It’s available for preorder now and will be available on Amazon August 28th. If you’re interested, click here.